Post Inauguration: All Aboard the Michigan Express! Now that the whirlwind of the 2006 Granholm/Cherry (et al) Inauguration has passed, it's time for some more substantial blogging from this end. Of course, you can always catch LiberalLucy's analyses of today's events in Lansing via Michigan Liberal here and here. And also check out some great photos by Cathleen over at her blog! Keep it up, chica! The inauguration is now over -- and now it truly is "all hands on deck." But instead of all hands on deck, I'll chime in with "all aboard!" And what better way to ring in the statement than to talk about Michigan's passenger rail service. You may not know it, living in the Automotive Capital, but Michigan is home to three Amtrak passenger rail line services: the Wolverine (Chicago-Detroit), the Blue Water (Chicago-East Lansing-Port Huron), and the Pere Marquette (Chicago-Grand Rapids). Photo: Michigan Department of Transportation. Click to Enlarge Map... sort of. I absolutely love the train. It costs $50 round-trip -- a much better alternative to air travel. No heinous downtown parking fees in Chicago. It takes me straight from Chi-Town to Lansing -- or to Kalamazoo to visit the BFF on occasion. There's plenty of room, you can use your cellphone, and outlets are abundant so I can easily work on my laptop as we cut across Michigan (preparing for that next knock-out blog entry, no doubt)! Delays do occur, but remember fellow Michiganians: for most of these routes, Amtrak does NOT own the rail tracks. Only a stretch from Indiana to Kalamazoo are in the hands of Amtrak themselves, providing a high-speed corridor to boost travel time. From Indiana to Chicago, or anywhere outside of the KZoo corridor, Amtrak needs to move on over for any and all freight traffic that may come. And trust me. Having to stop right outside of downtown Lansing after the hardy commute is one of the most frustrating experiences in the universe. At that point, it's a good thing that Amtrak sells cabernet savignon by the 1/2 bottle. But even with the price, convenience, and luxury of travel (sans the unavoidable delays), passenger rail is constantly beset by a lot of negative word-of-mouth. From the common citizen to the flippant (oft republican) politician, Amtrak means a few (often misconstrued) things: frequent delays, slow travel, costly to fund, not a money maker. And these negative images have threatened two of Michigan's three lines for years. The Pere Marquette and Blue Water routes are State-supported routes; only the Wolverine line is a national corridor route, and also has the highest in ridership in the state. Simply put: Michigan funds its west-side and capital city rails. Only Detroit gets the Federal love -- ironic to all get-out, I know. So it comes as little surprise that in Fiscal Year (FY) 2005-2006, the Michigan House Appropriations committee proposed to cut the Amtrak budget short $1 million ($7.1m in FY 04-05 down to $6.1m) in a gamble to push Amtrak to relocate an engineering station from Indiana to our home state. The station wasn't going anywhere, so the two State rails were again on the chopping block. Luckily it was saved through additional federal funds, though the future was still uncertain. But the times are a-changin'. 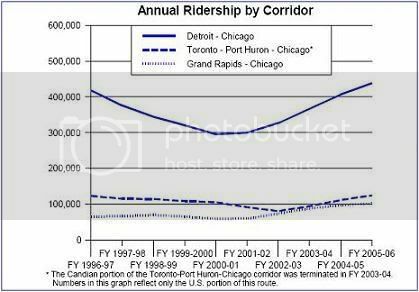 Source: Passenger Rail Service in Michigan, w/ MDOT data. Source: Passenger Rail Service in Michigan, w/ Amtrak and MDOT data. 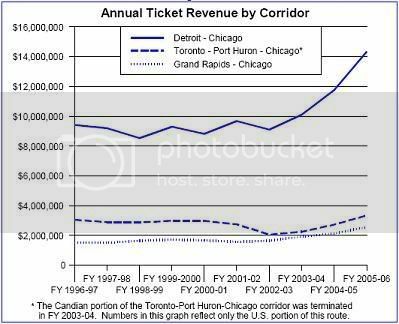 "(2) Any state subsidy for rail passenger service between Grand Rapids and Chicago and between Port Huron and Chicago shall be limited to an amount equal to revenue generated from operation of these routes, including, but not limited to, revenue from fares and concessions. The state subsidy shall not exceed $7,100,000.00." Source: Act No. 245, Public Acts of 2006. I won't pretend to fully understand this right now, since reading bills and acts for varied FY budgets at 2am makes me hemhorrage from the skull. Still: passenger rail is growing and received the necessary funding to keep the Pere Marquette and Blue Water routes active in the next year. As we tighten our belts and prepare for the budget of 07-08, hopefully we won't have to continue to engage in the will-we-or-won't-we Amtrak budget dance, keeping thousands of riders on their toes. If you're interested, check out Amtrak's Web Site for train schedules, fare information, and more. Trust me: get business class, especially if you're going from Chicago. You get to board early and bypass the mega-line of doom and get a free non-alcoholic drink, all for an additional $8. Next round, I'll return to some photoblogging with Lansing area train stations, architecture, and some wishful thinking. Cheers!